Butter Oat Prawns made with butter, cereal or oats, garlic, curry leaves, chilli padi, sugar, salt and oil. 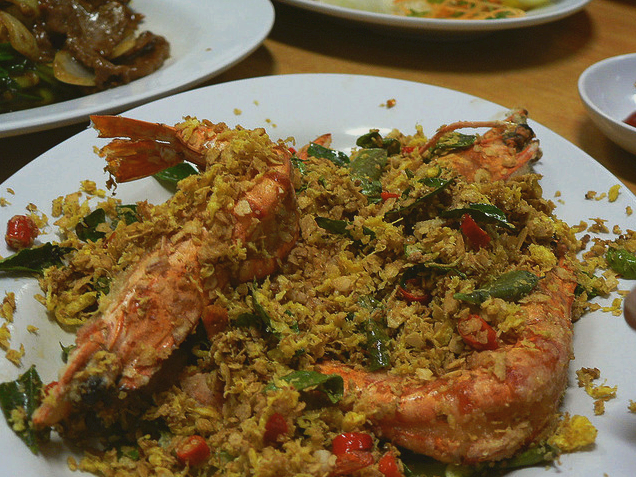 In Singapore, when families dine out, usually Butter Oat Prawns will be one of the usual prawn dishes on the table. Trim prawns, cut off antennae and devein the prawns, rinse and drain. Heat oil in a small deep pot, deep fry the prawns in batches until golden brown. Remove and drain on paper towel. Melt butter over low heat, fry garlic, curry leaves and chilli padi until fragrant. Add in the cereal and sugar, stir fry briefly. Add in prawns, salt to taste and coat with oats mixture evenly for about 30 seconds. You may add 3 egg yolks (beaten) to the dish. Heat up 1-2 tbsp margarine in a frying pan over medium heat then add in the beaten egg yolk, stirring gently the dripped yolk to the pan with spatula. Swirl the egg yolk until it forms crispy streaks. Remove and drain on aside and mix it together to step 4.